11th September: I posted about 'Flutter' here. 11th October: I fluttered my wings and landed in Superdrug. I've used them, and they're soft, but not so dense (the big brushes). That little lip brush is great for drawing a crease. 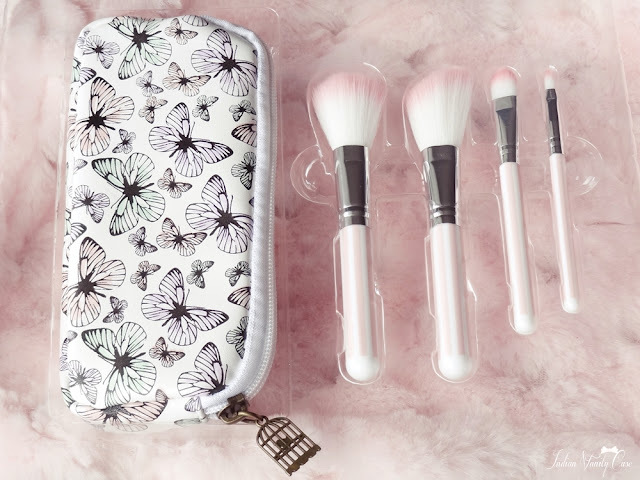 Flutter Cosmetic Brushes ~ £9 £6 | Rs.584. Flutter Double Sided Compact Mirror ~ £5 £3 | Rs.292. Everything in this series is ultra cute. Oh My! That Cute Bird Cage Locket!! So Cute!! The Packaging is So So Cute! ..aweee I love the bird-cage zip lock! vanity no apologies, is so apt...they look freaking cuuute! Glad you bought them.. It as if they were made for you :D Love it.